En route to Bunbury I stopped in Fremantle to look at two museums – I stopped in Fremantle again on the way back to stay with some friends. ▲ My first stop was the Maritime Museum with all sorts of interesting exhibits about Western Australia’s seagoing history including a pearl lugger from the old pearl diving days on the far north coast. Star attraction, however, is Australia II the ‘winged keel’ racing yacht which brought the America’s Cup to Perth back in 1983, ending the longest winning streak in sporting history. The New York Yacht Club had held the trophy since 1857. 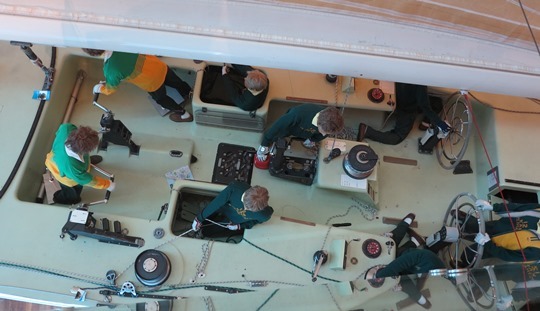 The Maritime Museum has figures of Australia II’s crew hard at work, including the skipper John Bertrand whose birthday is next Saturday, 20 December. So is mine, we were born on the same day and year. Since that 1983 victory the cup has taken up residence in New Zealand and Switzerland as well as in Australia. Currently it’s in San Francisco after the Oracle Team USA 17 catamaran defeated the New Zealand challenger Aotearoa in 2013. The next round will be in 2017 and will be held in Bermuda. 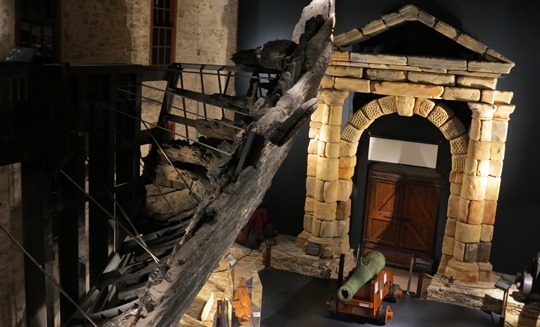 ▲ What I really wanted to see in Fremantle was the Batavia exhibit in the nearby Shipwreck Galleries. The Dutch East India company ship Batavia went down off the Western Australia coast in 1629, en route from the Netherlands to Batavia in Indonesia. Today that’s Jakarta. The Batavia shipwreck was followed by a harrowing tale of mutiny and massacre, before rescuers arrived from Batavia. There are all sorts of interesting artefacts from the shipwreck including a substantial section of the ship’s hull along with information about the wreck and its aftermath. For me the real highlight is the stone gateway which was intended to be the entrance to Batavia castle. It went down with the ship and lay on the seabed until it was salvaged in 1972. It’s a wonderful shock coming across this stonework in Fremantle.